The Arizona Loan Baron - Rate Volatility Lowest in Decades; Is Housing a Factor? Rate Volatility Lowest in Decades; Is Housing a Factor? There are a few different ways to measure volatility in the bond market, but one of the simplest is via the average daily trading range. That particular metric is showing volatility in line with the lowest levels in decades. 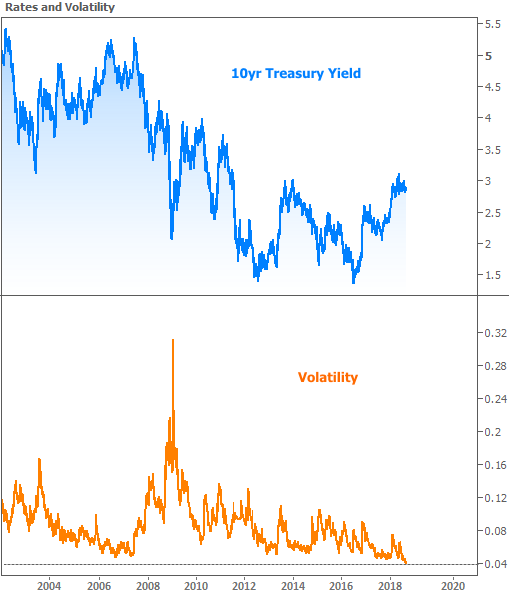 The lower volatility goes, and the longer it stays low, the more likely we are to see a big move in rates. Many would argue that such a move would be toward lower rates, simply because we've spent so much time moving toward higher rates during the past 2 years. There is actually plenty of historical support for that line of thinking, but there is also a catch. The catch is that the sharp move higher in rates over the past 2 years is far from serendipitous. In fact, rates have good reasons for being where they are. Those reasons would need to change before we see low volatility give way to a big drop in rates, and that could take months. One of the most obvious reasons for rate movement is the outlook for Fed rate hikes. Before you get mad at the Fed, understand that their policy outlook is largely dependent on inflation, unemployment, and financial stability. Those three things also affect longer-term rates (like mortgages). In that sense, the Fed's outlook is merely exhibiting symptoms of the same disease. Nevertheless, the Fed has some latitude in how it interprets the raw data. 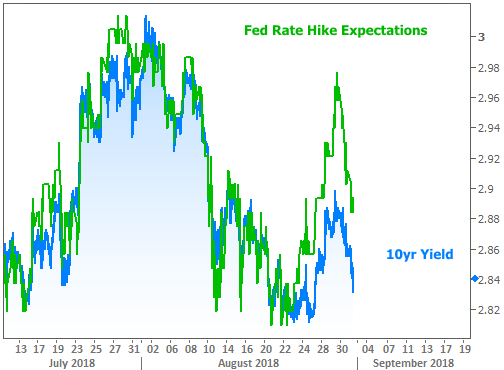 If its interpretation results in more hikes, longer-term rates (which tend to be highly correlated with the Fed's rate hike expectations) would have a tough time moving lower. 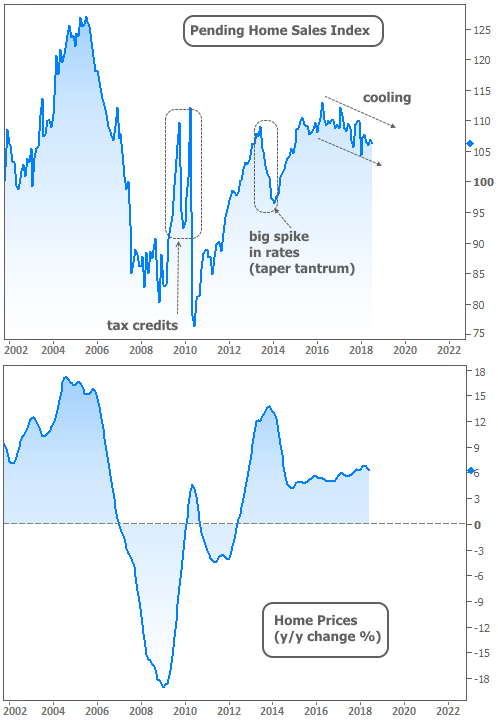 By that same rationale, if something happens to make the Fed second guess its stance, that's generally good for rates. As we learned last week, the cooling of the housing market is one such "something" on the Fed's radar. 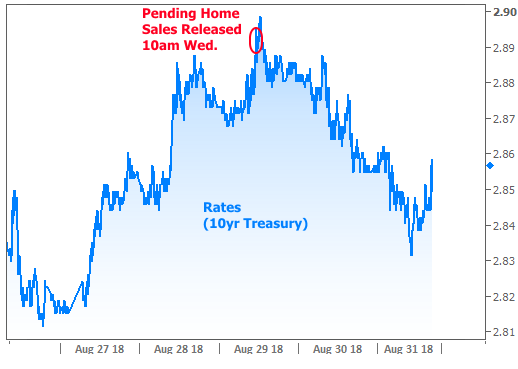 With that in mind, it wasn't too surprising to some improvement in rates this week immediately following a weaker reading on Pending Home Sales. But before we get too carried away connecting the fate of financial markets with the housing market, let's get a few things straight. We're not anywhere even remotely close to comparing the current cooling trend to the crash that preceded the Financial Crisis. Indeed, Pending Home Sales haven't even lost half the ground lost in 2013 after the taper tantrum (big spike in rates). Moreover, sales have been holding near post-crisis highs--this time without any help from the homebuyer tax credits that briefly juiced the housing market in 2009/10. Finally, the home price trend is on another planet compared to 2006-2008. While the annual pace of appreciation is likely to ebb, it's still well over 5%, depending upon whom you ask. All of the housing-related counterpoints in the past 2 paragraphs can be seen in the following 2 charts. All that to say that we may want to think twice before placing too much importance on the housing market as it concerns this week's movement in financial markets. The Fed's eyebrows are raised, but they're far from panicked. Besides, there were plenty of other candidates for inspiration, including recently higher volatility in European bond markets. We almost always tend to see at least some spillover from Europe when it comes to bond trading (the stuff that drives interest rates). European rates were surging higher in the first half of the week. 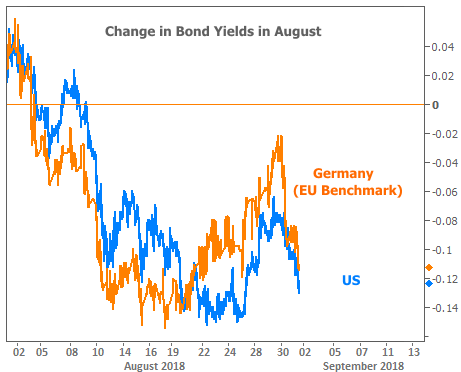 Their recovery coincided with the friendly bounce in US rates (note: Germany's 10yr yield is the benchmark for the EU due to Germany's dominant financial role in the EU). Does this friendly bounce mean we're well on our way to ending the trend of record-low volatility with a triumphant move lower in rates? Again, such a thing could take months, if it happens at all. There are also warnings on the other side of the debate. We can see these if we take one more look at Fed rate hike expectations--this time with a wider lens. The following chart shows a few instances where rate hike expectations have pulled away from US 10yr yields. The late 2017 example had more to do with year-end bond trading idiosyncrasies. The recent example, however, merits caution. 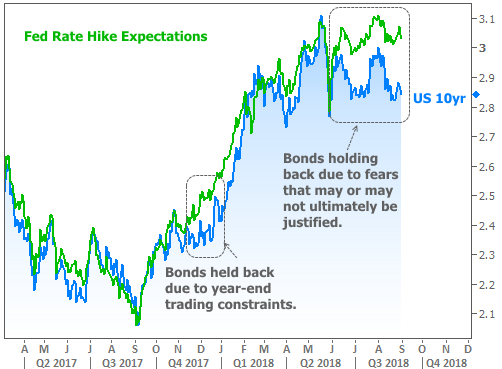 It suggests that rates are slightly lower than they otherwise would be because of things like trade war uncertainty, emerging market turmoil, and the general risk-aversion some investors feel due to the staying power of the current economic cycle. If those cautionary fears turn out NOT to be justified, the next big move in rates could just as easily take the form of the blue line catching up to the green. On a side note, this coming Monday is Labor Day. Banks, title companies, financial markets, and most mortgage lenders will be closed. While there's no rule preventing individuals from working on Monday, a Federal banking holiday means few--if any--lenders will be able to lock or close loans until Tuesday. The Arizona Loan Baron is at your service! I would appreciate the opportunity to share with you my extensive mortgage lending experience. 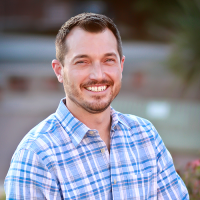 My client focused approach has allowed me to build long lasting relationships and partnerships throughout Arizona. I know this market. I live here and work here. Please allow me the opportunity to be your mortgage lending partner.